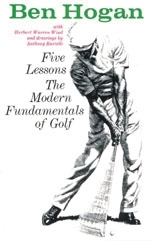 This book covers the Fundamentals, Grip, Stance, Posture, First & Second part of the swing and a short summary & review. To quote Ben, "It is utterly impossible for any golfer to play good golf without a swing that will repeat." Mr. Hogan believes there is no reason why a golfer can't play in the 70's. This assurance is built on the belief that the average golfer is capable of building and repeating a swing. Young Texas born Ben Hogan was a caddie with a dream and a determination to "make it." His first attempt at the professional golf tour failed. On his second attempt, with only a few dollars to his name, Ben Hogan's relentless practicing began to pay off. And so began an eight-year climb to the pinnacle of golf. In the prime of his career, a crippling automobile accident threatened to end it all. Very few doctors believed that he would ever walk again, but Hogan risked everything to once again be a champion, and in doing so, won the hearts of all America. Preface by Herbert Warren Wind and incredible drawings by Anthony Ravielli. Paperback.